FLEMING ISLAND (FL) – Nets stretched across the Barco-Newton YMCA gym. Fletcher Turner, 70, grabbed his paddle and headed to the blue-lined court with his partner. He stepped behind the baseline, stretched his paddle out behind him with one hand and held out a plastic, whiffle-type ball with the other. He dropped the ball and swung, sailing it diagonally across the net into his opponent’s service box. And after a few more serves and volleys, Turner and his partner won their game of pickleball. 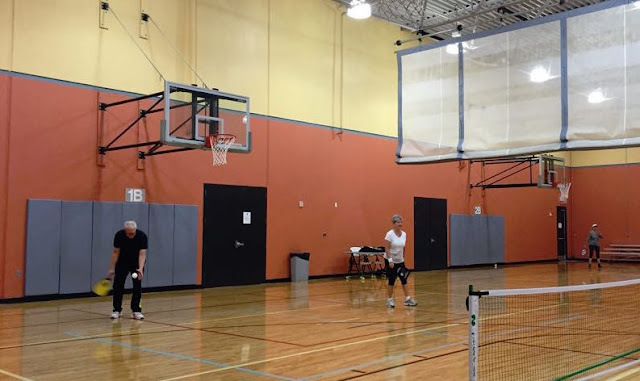 Pickleball has been described as one of the fastest-growing sports in the U.S., with leagues popping up and tournaments being played more all over the country. “Anyone who plays falls in love with it right away,” said Edith Hardee, 71, another pickleball devotee.